The Fireman's Drinking Fountain was dedicated in 1909 by Hose Company # 1, Slatington. 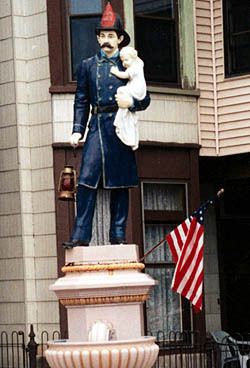 The 12 foot high statue was purchased from J. W. Fiske Iron Works, New York City, for $700 and depicts a volunteer fireman carrying a child on his left arm and holding a lantern in his right hand. The lantern is illuminated with an electric light bulb at night. Erected in the center of the Borough of Slatington, to supply a public water source on Main Street, the fountain was designed to provide a drinking fountain for people and a drinking area for horses and dogs. The purchase price was raised through the donations of many local residents. The statue was intended to be symbol of volunteer service, vigilance, and humanity. It does not memorialize a deceased firefighter, but instead honors the living as well as the spirit of voluntary service in the Slatington region. The importance of this statue to Slatington was demonstrated when it was damaged in October, 1979 by an automobile. Through a tremendous community effort the Fireman's Drinking Fountain was restored to its original form, and rededicated on July 19, 1980. The Fireman's Drinking Fountain is located on Main St., adjacent to the Slatington Public Library, in Slatington.